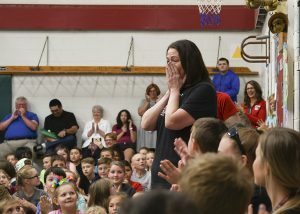 MEA member Laura Chang, a second grade teacher at Sunset Lake Elementary School in Vicksburg, was honored Friday morning as the 2018-19 Michigan Teacher of the Year at a surprise assembly attended by officials from the Michigan Department of Education (MDE), family members, and cheering students and staff at her school. Chang is described as a classroom teacher who principals rely upon, parents lobby for, colleagues admire, and students love. She serves as a mentor teacher in her district and also teaches pre-service educators part-time at Western Michigan University. After 18 years as an educator in Vicksburg, south of Kalamazoo, Chang is guided by a big-picture view of her role and a whole-child philosophy encompassed in those three priorities she looks at every day on the back of her phone. “We’ve got to keep the big things big,” she said, referring to the “big rocks” metaphor for staying focused on the most important reasons for teaching. Her first “big rock” priority is to create kind, collaborative, contributing members of the community, she said. Everyone has a leadership role but also works with others to accomplish goals. The class sets academic and behavioral goals and monitors progress. “And if we fall short, we examine that as a group,” she said. Chang is not alone in that mission. The entire Sunset Lake staff is in the second year of implementing the “Leader in Me” model, based on Covey’s work. The initiative aims to equip students to be 21st-Century leaders. Five years ago, Sunset Lake was labeled a “Focus School” by the state, one step above the most struggling “priority” status. Three years of work in shifting the school’s culture and getting everyone pulling in the same direction has paid off with improved student achievement, said Principal Amie McCaw. Chang plays an integral role on the team leading change in the building, and she works as the district’s technology integration leader, but most importantly she inspires others as a joyful educator who “serves from the heart,” according to McCaw. Chang was inspired to be an educator growing up with a father who worked as a math and science teacher for many years in Frankenmuth. Her parents were on hand for Friday’s ceremony, and her dad – Gary Bruns – said he knew she would be a teacher after watching her skillfully manage three young children as a 12-year-old babysitter. “I knew she’d be good, but I didn’t think she’d be this good!” he quipped. Chang previously worked as a literacy consultant in the district, coaching other teachers on strategies for teaching reading. She still teaches an undergraduate course at WMU showing secondary-level content area teachers how to incorporate literacy work in their classrooms. Many of the students are skeptical at first, and Chang said it’s fun to watch their ideas evolve as they begin to understand the connection between their subject matter – high school physics or math, for example – and literacy. “I feel like sometimes we’re given the opportunity to do things only to find out where we’re truly meant to be,” she said. As Michigan Teacher of the Year, Chang will serve as a voice of educators at monthly State Board of Education meetings, and she will chair the Michigan Teacher Leadership Advisory Committee, ensuring that educators’ voices are heard on policy issues. Teachers of the Year from all 50 states also attend various events together throughout the year, including a trip to Washington, D.C. and to Space Camp at Alabama Space Academy for Educators. 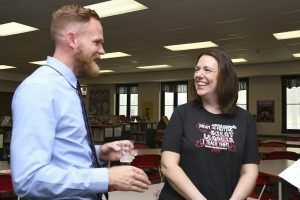 Last year’s Michigan Teacher of the Year, Kentwood Public Schools math teacher Luke Wilcox, traveled to Vicksburg to lend advice and encouragement to Chang. There are so many teachers who give their heart and soul to the profession and work with their young charges with love and devotion to helping them become the best that they can be. It is appropriate that one of the throng is selected for special recognition and serves to remind us of what it means to earn the title of “Teacher”. Congratulations Ms. Chang and kudos to a school district that has the vision to allow good teaching to flourish.